Isiah Factor | The Insite » THE FUN AND DANGER OF AN EARLY MORNING NEWSCAST! THE FUN AND DANGER OF AN EARLY MORNING NEWSCAST! 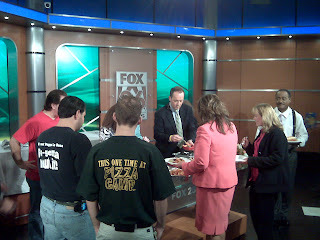 October 14, 2009 | Posted in Uncategorized | Comments Off on THE FUN AND DANGER OF AN EARLY MORNING NEWSCAST! EVERYTHING YOU EAT IS FREE AND DELICIOUS! It’s always fun working on those early morning newscasts. You’re up before the crack of dawn and you get to tell the viewers what happened while they slept through the night. But the most fun comes with the cooking segments. It’s when guests come on and cook up a storm. That happens a lot at FOX 26. 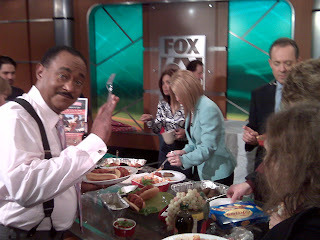 Here I caught the morning crew at the end of the show essentially pigging out on the remains of that cooking segment. The dangerour aspect of a morning show is you eat all the time and if you’re not careful you could end up a few pounds heavier with all the free food. Here I was able to capture Jose Grinan, Sibila Vargas, Tom Zizka, Pattie Shieh, Kristie Powers, Ruben Dominguez, and many more enjoying the remains of the show. Eat away guys!